Chest-Style enclosures are manufactured from 1/8” aluminum and are powder coated with a bright white polyester prouder coat finish. All enclosures include a reinforced top edge. 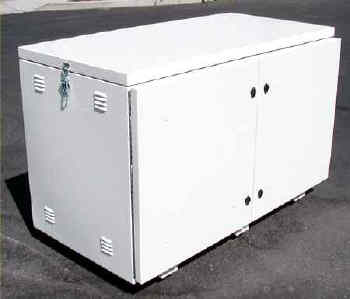 Many enclosures are listed for Concorde, Deka (MK), and Surrette batteries but we can build them to virtually any size. The boxes have a stainless steel padlock hasp. Please feel free to contact us for a quotation for a size or enclosure not listed. Keeping with our reputation for providing tough products our battery enclosure line is no exception. All POWER-FAB battery enclosures manufactured by Direct Power and Water Corporation are built to high standards to provide a rugged, high quality product. The standard chest enclosures are manufactured for Deka, Concorde, and Surrette batteries in addition to the generic Groups 27/30, 4D, 8D, L16, and “golf-cart” type batteries. Standard enclosures are manufactured with .125” 5052-H32 aluminum. All die marks and welds are sanded smooth. and finished with a reflective bright white polyester powder coat. This finish provides a highly reflective surface to minimize internal heat gain. All enclosures are provided with integrated louvers located low on one side and high on the opposite side to promote convective air flow through the enclosure to reduce internal temperatures and remove gasses. Filters are located over the louvers to keep out dust and insects. The filters are removable for cleaning or replacement. All standard enclosures are built to meet NEMA 3R specifications. Enclosures are available in NEMA 4 and NEMA 4X for certain situations. All battery/equipment enclosures are provided with a limited five year warranty.